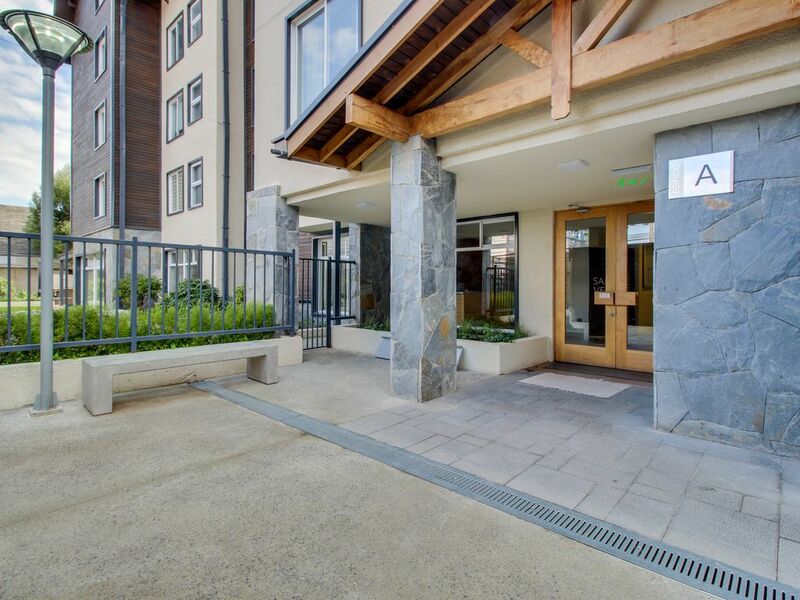 Surrounded by the beauty of Lake Llanquihue, this contemporary Puerto Varas condo offers the ideal spot to get away from the hustle and bustle of the daily grind. With access to a fitness center, shared outdoor area, and lake views, relaxation and fun will always be at hand. Perched just west of the center of Puerto Varas and less than half-a-mile from the shores of Lake Llanquihue, you'll be able to unwind in the natural beauty while having easy access to local attractions. Light pouring in from the large window showcases the accents of purple throughout the main living area. Kick back on the couch and play one of the provided board games while your guests check out what's on cable on the flatscreen TV. Put a load of dirty clothes in the shared washer/dryers and then head down to the shared community area to use the charcoal BBQ. Connect to the WiFi to find a recipe, or swing back to your place to put the fully equipped kitchen to work. The convenient galley-style kitchen offers a breakfast bar, chic wooden cabinets, and a microwave to help you put dinner on the table. Enjoy the meal at the breakfast bar, and then head down to the community area to dive into a nightcap and make some new friends. When it's time to retire, this one-bedroom, one-bathroom home will host three guests. In the bedroom, there is a soft double bed waiting to lull you into a restful night of sleep. If you need more sleeping space, there is a fold-down futon in the main living room. Wake up early and head down to the fitness center to get a heart-pounding workout in, and then get your group ready for a day of exploring and discovery. Stroll along the shores of Lake Llanquihue and snap a few pictures of the stunning scenery. Puerto Varas itself, a cultural blend of German and Chilean influences, has a variety of restaurants and shops - don't miss stopping by the iconic Iglesia del Sagrado Corazón, one of the city's most famous landmarks. Spend a day hiking through the tree-lined trails that crisscross the majestic Osorno Volcano. Offering priceless views and the perfect spot to spend a romantic moment with your special someone, this is a place outdoor lovers will never want to leave! Whether you're kicking back in the community lounge area, wandering along the lake, or simply reveling in the beauty of Puerta Varas, this Chilean escape puts them all at your fingertips! The apartment was lovely with really fast Wi-Fi too, and the manager, Dario, was super attentive, nice and made sure I had food in the apartment for New Year’s Day when the stores would be closed. The concierges were very kind and helpful as well. This is such a beautiful area of Chile, and, thanks to being able to stay in such a lovely place with great service, I was able to relax, explore beautiful nature and towns and come home to recharge to do it all over again all week! Thanks, Dario! Tiene todo los que se necesita. Muy limpio y cómodo. Solo faltan algunas frazadas extras. Muy buena ubicación, el edifico se veía nuevo y el departamento estaba impecable.